Extra Rare Vintage / Special Grade Custom Silver Needle / TeaStation & ‘Tea Taster’s Choice’. India White Tea is very rare. 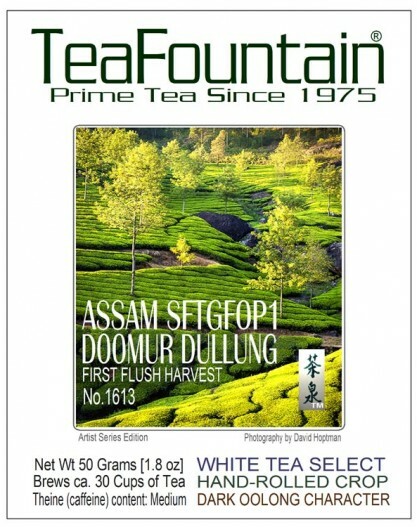 The ‘Doomur Dullung Estate’ is part of the ‘Assam Company’ which was the first tea company to be formed in India. Only approx. 50 pounds of these well-aged Silver Needle Tips & leaves are picked a few days in the year. 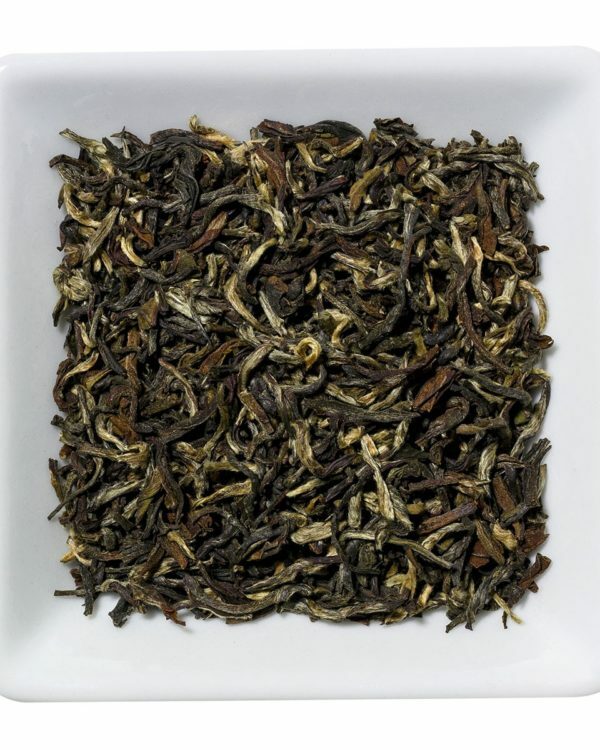 Slightly fired, steamed and dried in the open air give this tea its exquisite dark-sweet taste. 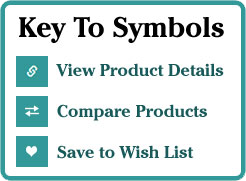 Serve as all-day or special dessert tea. Like this rare find for ‘Tea Connoisseurs’, we still offer the best qualities of much sought-after spring crops. Tea Station & Tea Fountain Custom Grade. Mature Estate Quality. Extra Rare Vintage | Special Grade Custom Silver Needle | TeaStation & ‘Tea Taster’s Choice’. 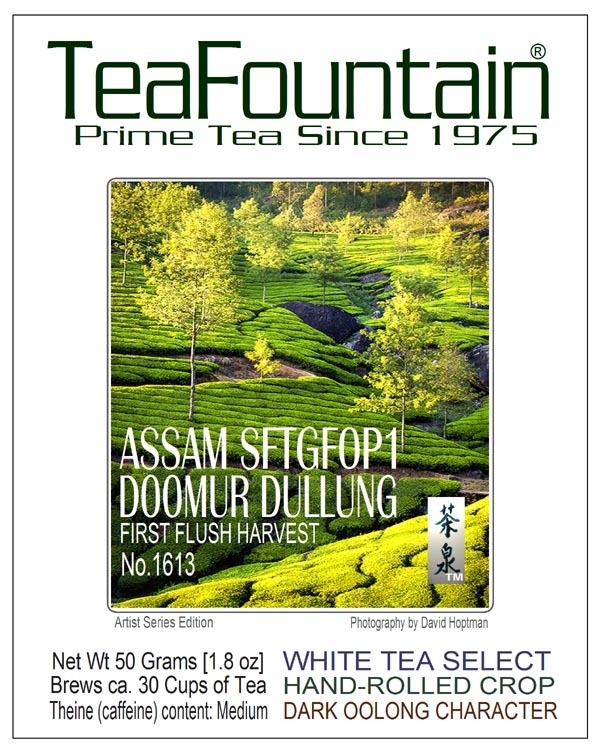 Ingredients: Whole Vintage Leaf White Tea and Silver Tips from the Doomur Dullung Estate in Assam, India. We started offering highest-grade crops like this collectable selection for clients and customers under our European TEA STATION label in 1975. 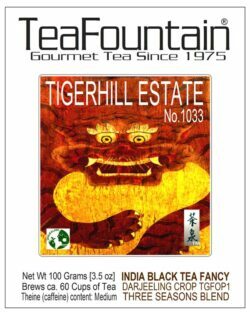 Since 1997 our traditional teas, custom blended tea designs and tisanes are also known and sold in the United States. 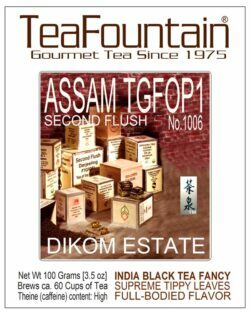 For over 40 years the Top Quality and reasonable pricing of our special grades make them very popular selections for tea connoisseurs and clients in the Culinary Industry. 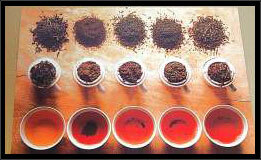 This tea selection is part of our sponsored Artist Series: Photography by David Hoptman. Artist Info: DAVID HOPTMAN was born and raised in Detroit, MI. He studied at Oakland University before moving onto College For Creative Studies where he majored in Photography with a minor in Printmaking. David has been an artist and commercial photographer for nearly thirty years. David’s fine art background and familiarity with a multitude of artistic genres is what enables him to create originally distinctive imagery, as well as exhibit a keen sensitivity to his client’s needs. If you are ready for a positive change and a new eye catching look, it’s time to check in with David Hoptman. His creative ideas and ability to pull them off will make you a believer. From 2004-2010, David taught photography, made art, and shot commercial images for select clients while living in Tuscany, Italy. His client list ranges from “Sotheby’s”, “Architectural Digest” to main-stream publications like “Art in America”, “Cowboys and Indians Magazine”, “Trend Magazine”, “Southwest Airlines Magazine” etc.